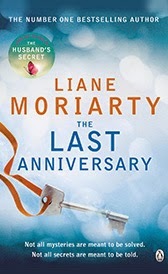 Anyone who reads my blog will know that I am a huge fan of Australian writer Lianne Moriarty. I read The Husband's Secret last summer and What Alice Forgot not long after and enjoyed both of them, so I was sure I'd enjoy the latest addition. The Last Anniversary focuses on the character of Sophie Honeywell, a romantically-inclined dreamer wondering whether her boyfriend, Thomas was the one who got away. Now back in her life, Sophie has inherited his aunt Connie's house on Scribbly Gum Island - home of the famously unsolved Munro baby mystery. Moving to the island, she begins a life as part of an unconventional family where everyone has a secret and everyone is battling their own problems. From new-mother Grace to unhappy Aunt Margie, Sophie sees herself drawn into a world while still wondering what on earth happened to the Munro baby so many years ago. As always, I was easily drawn towards the characters and the story was well though-out with enough twists and turns to keep you enthralled. Unsurprisingly for books like this, I also found myself not guessing the ending - leaving a nice twist at the end. Setting the book on an island in the middle of no-where gave a certain romance to the story, while veering away from the usual chick lit cliche. I found this one difficult not to devour in one sitting, while feeling incredibly attached to the characters by the end! If you've got a spare afternoon, I definitely recommend you give it a read and when you've done that, check out some of her other great books.